Have you ever experienced a time when everything seemed symbolic of what you were doing or thinking? Everything has a deeper meaning. Your awareness is such that everything talks to you. You drive down the street and ask the world, "Which way should I go?" Then you switch on the radio long enough to catch one word and the word is,"...straight." In 1988, Avra and I were traveling in Central America. This was the same period when I was organizing the Avatar materials and finishing the research for The Wizard Course. The questions I was struggling to answer were what comes first, what lessons build upon each other? How do you structure a curriculum so that it parallels the development of something as intangible and immeasurable as spiritual growth? After many weeks of rumination — some spent diving an underwater reef and some trekking to the rim of an active volcano—I arranged the lessons by an intuitive feel. Everything I had written went into five sections, spanning three courses. If someone had asked me to explain why, I wouldn't have had an answer. But providence and the world were about to give me one. I promised Avra that as soon as the work was finished, we'd take a few days off to relax and tour around. I called a friend in Miami to check in and let him know we were all right and would be leaving San Jose. He was anxious and was glad to hear from us. As we chatted, he asked, "Have you heard anything about the Jungle Train?" "Jungle Train? Never heard of it," I said. "It's in Costa Rica, somewhere near you, and I heard it's interesting." After telling him I would think about it, I hung up and crossed the hotel lobby to check out. The hotel clerk, who had overheard my call, asked in broken English, "Señor, do you do the Jungle Train?" "Maybe. What's the Jungle Train?" I asked. "I show you." The clerk pulled out a stained map and, using the handle of his fly swatter as a pointer, traced the route of the Jungle Train. "It starts here in Limón, goes up through the jungle and over the mountains along the Nicaraguan border and down to Puntareña. Real train, not for tourists." He went on for several minutes, pointing out stops. The Jungle Train predated the modern East-West Highway and had once been the only route from the Caribbean coast of Costa Rica, up through the mountains and jungles and down again through the banana plantations to the Pacific coast. It ran mostly for the local villagers who were isolated from the highway. He rummaged in a drawer and produced some old photographs: panoramic views of the jungle, train trestles over steep gorges, and the winding streams of the western rain forest punctuated with banana groves. Much more enchanting than the coffee plantation-covered slopes of San Jose. A few minutes later, Avra asked me what he was talking about. "He was explaining to me about the Jungle Train. Made it sound awfully good." Then as an afterthought, I said, "Sort of an Avatar Section One, only about the Jungle Train." We gave each other the you-don't-say face that people make when coincidence intrudes on their lives. We arrived in Limón at sunrise prepared for an adventure. From a ticket booth made out of an old refrigerator box, we bought two first-class tickets. The train consisted of six cars, three passenger cars with windows without glass and park bench seats, and three boxcars. The first two boxcars had hay-bale seats and were for the locals. The last boxcar carried freight. 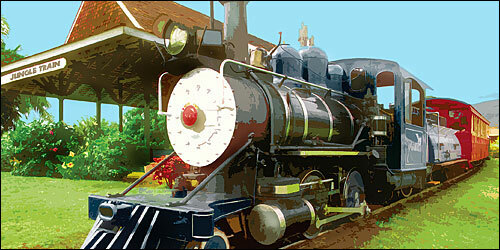 The locomotive was a small coal-fired steam engine with a coal and water tender. Our first class tickets gave us the privilege of riding in the front passenger car. As we boarded, a dark-skinned woman glared at us and sneered, "Ojos gringos" (gringo eyes). We felt out of place and for a minute considered abandoning the trip. Also it seemed everyone, regardless of fare, had decided to crowd into the first class car. We soon learned, à la Section Two Avatar, that all passengers were responsible for their own trip. No conductors, no dining cars, no rules. The only non-passenger was the engineer, and he was so busy loading coal and adjusting levers that he never looked back. The little train lurched from Limón on narrow-gauge tracks—barely a meter in width. We called the locomotive Little Toot and chanted along with its shss-chug, shss-chug, shss-chug, "I think I can. I think I can. I know I can." The train passed a hand-painted sign by a gas station announcing SERVE SELF. The word Caribbean comes from the Caribs who were a tribe of cannibals in the West Indies. Being a cannibal is about as deep into serving self as you can get. Serve self. Our you-don't-say faces were working overtime. People rode on top of the train, between the cars, and standing up in the windows. (Liability suits are unheard of in Costa Rica.) I hung off a boarding ladder and snatched wild flowers from the bank. As a friendly gesture, Avra wove them in a little girl's hair. Smiles. Every few minutes the train stopped, and more people clambered on. It seemed more like a local bus than a train. 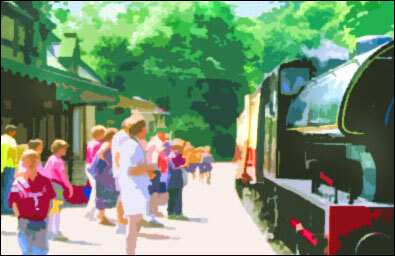 Our speed seldom exceeded a fast walk, so passengers boarded wherever they pleased, handing up children to strangers and then jumping on themselves. Sometimes, we heard, children were handed up and no one followed. This was a poor country. Women in aprons ran alongside the train and offered food for sale. Fast food. We ate roasted plantains wrapped in banana leaves for breakfast and listened to the lively morning conversations. Neither of us understood enough Spanish to catch more than a few words. Babies smiled over mothers' shoulders at us, and the older children played soccer with a rag ball. 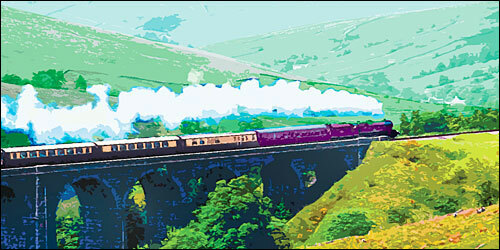 The train shss-chugged out of the land of the cannibals and began its gradual rise into the jungle-covered foothills. We were becoming comfortable with the trip, relaxing, listening, and feeling vulnerable enough to join in the experience. Just like the students on our Avatar courses. 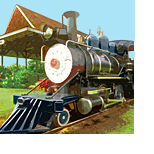 The Jungle Train was constructed at different times. It's really three different trains linked together. The first part, the part we were on, was built as a public transit system. The second part was built by a logging company, and the last part was built by the infamous US Fruit Company to connect its banana plantations with the major northern railroad running up the West coast. Curiously, each section was built with a different width of track. Around noon, we reached the end of the first section of track. Little Toot and the tender were uncoupled and parked on a siding. The tracks were changing widths, widening. Very symbolic, we thought, our understanding was widening. And our locomotive (motivation) was changing. The locomotives have fixed undercarriages and never leave their own sections of track, but the cars have undercarriages that can be adjusted. Everyone detrained while the new engineer cranked out the undercarriages of the cars to fit the new tracks—correcting a misalignment. We followed the crowd to a little rest area where spring water flowed out of a pipe drilled into the mountain. People lined up to kneel and drink from the pipe. When our turns came, Avra pointed to a name carved in the mountain stone. La Fuete de Vida. (Fountain of life.) We did our usual exchange of you-don't-say faces. Little Toot and The Avatar Course had the same destination, La Fuete de Vida. We walked back to the train humming an Iron Butterfly tune from the '60s, "In a gadda da vida, baby..."
In twenty minutes, a diesel locomotive was coupled to our transformed cars and ready to carry us over the mountains. The shss-chug of Little Toot was replaced by the deep rumble of a San Pedro turbine. We had evolved from coal to petroleum. As we lined up to board, a young woman lost her grip and fell backward. Strong arms caught her in mid air and passed her to other helping hands in the train. She giggled and then turned back to thank her helpers. Muchas gracias. A man arrived with a donkey cart of fruit boxes, and a spontaneous human conveyer line formed to help him load the fruit into the freight boxcar. We were taking care of each other. Service to others. The path had widened; the motivation had changed. Symbolically, we had begun The Master Course. San Pedro pulled us slowly up through a beautiful land of unspoiled jungles and rushing mountain streams. There were no villages in this area, so everyone was surprised when the train stopped and the hiss-clank of the air brakes shook the cars. A tree had fallen across the tracks. Passengers got off the train to study the situation. The still-rooted stump was on the uphill side of the tracks. The half-meter-thick trunk lying across the tracks would have to be cut. It looked like this might be the end of the line. The engineer rummaged in a tool chest and produced an old chain saw, but no one could get it started. I went out to help. I've cut a lot of firewood, and I remembered working with a saw like this once. It was a four-cycle Briggs and Stratton engine with a handle and blade bolted to it. Heavy and slow. I remembered there was a trick to starting it. You wrapped the pull rope around the drive pulley, tipped it on its side and loosened the sediment bowl below the carburetor until the gas began to leak. Then you turned the saw upright and held it between your knees, put the palm of one hand over the air intake to act as a choke and pulled the rope with the other hand. And you always prayed that the motor wouldn't backfire through the carburetor and burn your hand. The third pull was a success. In a minute I had the saw running and was cutting into the tree. The chain was dull, but rocking the saw and reducing the pressure on the blade resulted in slow, steady progress. I was aware that all eyes were on me. After cutting about two-thirds of the way down from the top side, I finished the cut working upward on a slant from the bottom—a precaution to keep the saw from getting caught when the trunk fell away. The self-appointed straw bosses nodded approval. Finally the tree was free of the still-rooted stump. Olé. Olé. Ojos gringos was a hero. Everyone now pushed and pried to swing the tree trunk away from the tracks. It was hard work. One of the men sang a chantey to create a rhythm and alignment for our efforts—dada dada whoosh, dada dada whoosh. The people who stayed on the train strained with the tree movers. Finally the tree was shifted off the tracks and allowed to slide down a steep embankment. After falling twenty feet, it produced a satisfying crash. Everyone applauded. The men patted each other on the back and included me in the ritual. The social transformation was symbolic of The Master Course. Everybody was helping everybody else to get there. Just after we crossed the last mountain, the San Pedro line ended. The new tracks ahead were even wider. So the undercarriages of our cars had to be cranked out again. This time we detrained as travel companions who had become friends. The fruit man brought a box of mangoes to the little overlook park. Fifty miles to the east you could just make out the Pacific Ocean. Climb a little rise, and through a valley in the mountain you could look back and see the Caribbean Ocean. The past and the future. The scent of wild onions in the air. The spicy sweet taste of fresh mango in the mouth. So much space that you couldn't hold definition—selflessness. We were graduating Masters. After a while the San Pedro locomotive was uncoupled and replaced with a San Isidro electric locomotive. We were ready to go again. The new locomotive made a powerful humming noise. Everyone thanked the fruit man and dropped change into his empty mango box. He protested, but accepted. Avra and I decided that the passengers symbolized undefined awareness, because everything else was slowly evolving, changing—wider tracks, new engineers, different locomotives, new scenery. Then something scary happened. As we were reboarding, armed soldiers, Contra rebels or one of the Nicaraguan death squads—a patrol from the nearby Nicaragua border—came out of the jungle and blocked the tracks. The engineer's protestations were cut short by five leveled M16 rifles. Two weeks earlier a tour bus had been stopped, and several American tourists had been kidnapped, raped, and murdered. Three of them, according to the report, had been nuns. As we stood in the boarding line and watched the soldiers walk down the tracks toward us, a very beautiful and compassionate thing happened. The same woman that had nicknamed me ojos gringos put her shawl around us and steered us back to the boxcar for the locals. We climbed in, a few urgent words whispered in Spanish, and people moved to surround us. A mother placed her baby in Avra's arms, and dirt was rubbed on my face. "Too white," the woman explained in English. Three of the soldiers worked their way through the first-class car asking questions, then made a quick sweep of the other two passenger cars and jumped back down on the tracks. One of the soldiers waved to his comrades blocking the tracks. "Vamonos," he shouted. Almost immediately the train jerked forward, back, stopped, and then moved forward again, slowly. The engineer was apparently a little nervous. Then we began to roll. Through the boxcar door I saw the passing faces of the soldiers only a few feet away. Boys! Probably not a day over sixteen. Boys with automatic weapons, and even more dangerous, with automatic minds. After the train picked up speed, there were expressions of relief and thanks. Our new family reshuffled to give us a little more room. I put my arm around Avra, and we leaned back on a broken bale of hay. We settled into the odors of sweat and unwashed bodies, mingled with food and tobacco smoke, and it was not the least offensive. We felt like lost wolf pups who had made their way back to the familiar scent of the home den. How strange, I thought, that a species would learn to react in disgust to its own scent. The real enemy is indoctrination; it drowns our natural humanity. San Isidro was very fast and powerful. Of course, it would never run on narrow tracks. And Little Toot would never see the west side of the mountains. Spiritual paths, we had finally understood, required different motivations for different parts of the path. The lessons had to fit the width of the tracks. You couldn't remain the same and make this journey. The afternoon sun strobed through the passing banana groves and seemed to mix with the softness of the hay. In the safe silence of trusted friends, I drifted into a dream state. Very wide tracks. Quiet and smooth. Contemplative rhythms. Civilization rushing past. Advanced lessons should carry people beyond their indoctrinated thinking, beyond the competitions that lead to insensitive brutalities. Love precious humanity. We arrived at Puntareña and hugged people good-bye that we had never met before and probably would never meet again. 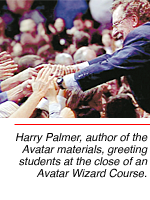 We had experienced each other's kindness and humanity and would respect each other forever—the very same experience I intended to convey with The Wizard Course. Avra and I walked the last mile to the beach to watch the sunset. We felt gratitude for another rich day of life. Pacific sunsets always remind me that I'm on a ball floating in space. Pacific, by the way, means peace.